Provided photo: Elderberry Jam will bring their fiddle music for a free concert next Sunday at the Cobblestone Museum. 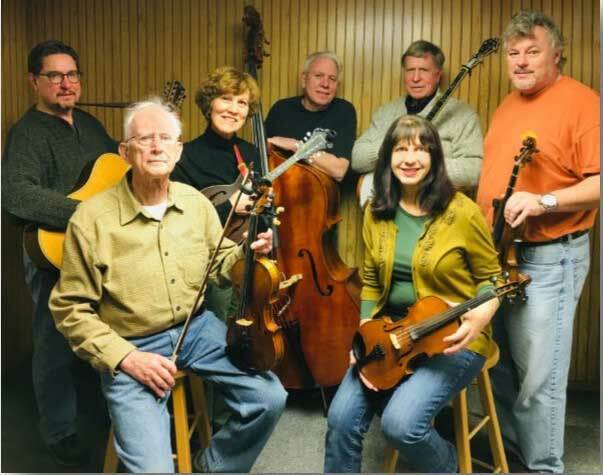 GAINES – The Cobblestone Museum will welcome a popular group of musicians for a special concert on April 14. 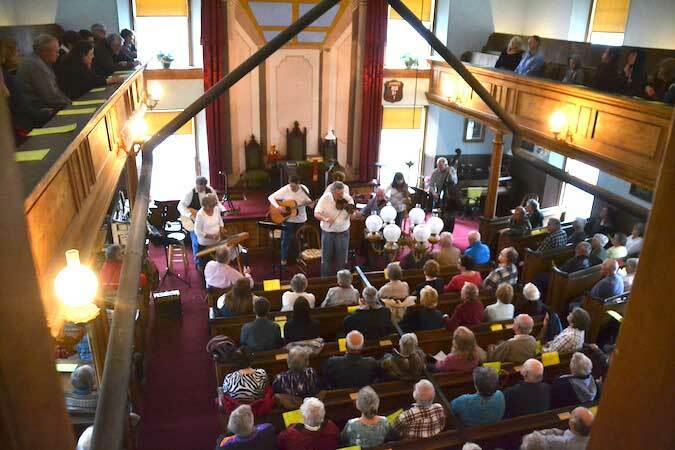 The 3 p.m. concert next Sunday will be at the Cobblestone Universalist Church, which will spring to life with the performance of Elderberry Jam, a group of very talented musicians from the Genesee Valley who will perform an old-time fiddle music concert. 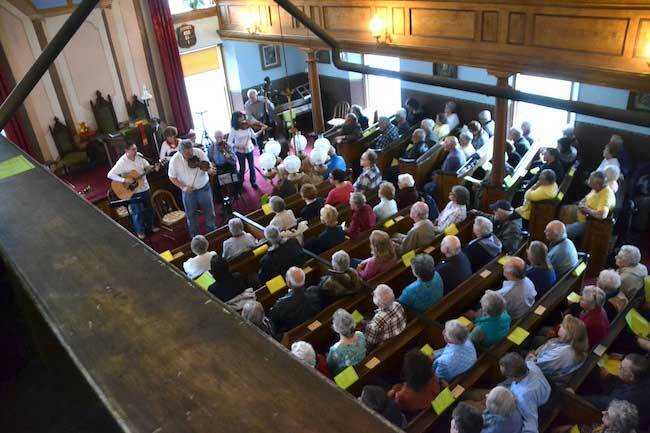 They will play waltzes, rags, polkas, jigs, reels, bluegrass and some “good old fiddle tunes,” said Doug Farley, director of the Cobblestone Museum . Elderberry Jam is a highly sought-after group which is very selective about where they perform, preferring to entertain only for non-profits. They had previously played for a short time at the Cobblestone Museum during a Historic Trades Fair in August 2017. 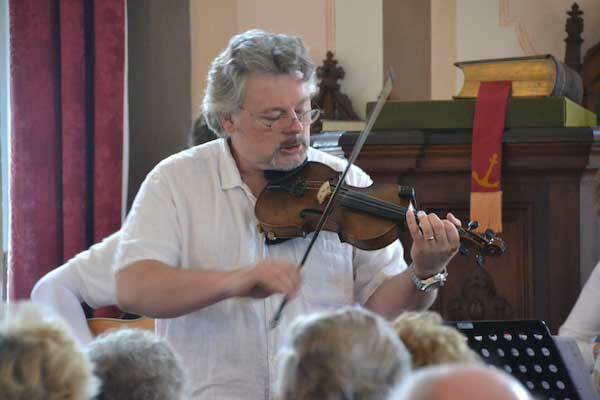 “We are part of the Fiddlers of the Genesee, and play the same music reminiscent of our forefathers who gathered together on a Friday or Saturday night to play music with their neighbors, forgetting about the trials and struggles of the week,” said Tom Bailey, a member of the group. Fiddlers of the Genesee is a music club that has been around for 28 years. 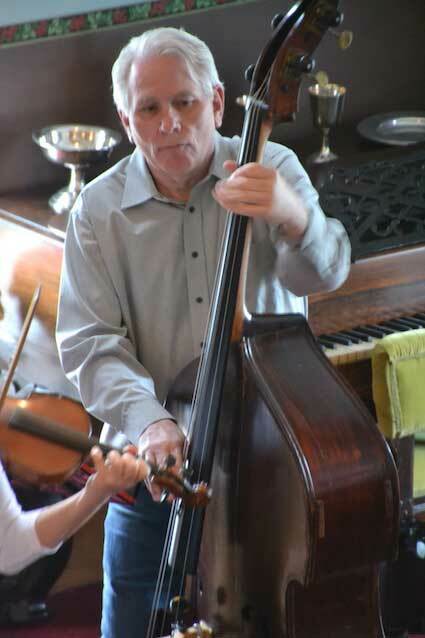 Photo by Tom Rivers: Fred Vieira plays bass for the musical group. They played outside next to the Farmers Hall during a Historic Trades Fair at the museum on Aug. 26, 2017. Falling under the genre of “old time fiddle music,” they play acoustic instruments and also include some Irish, Appalachian and Canadian music. The club gets together to play every Friday evening. 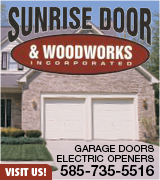 Its members come from Greece and Brockport to Fairport, Webster and Perinton. 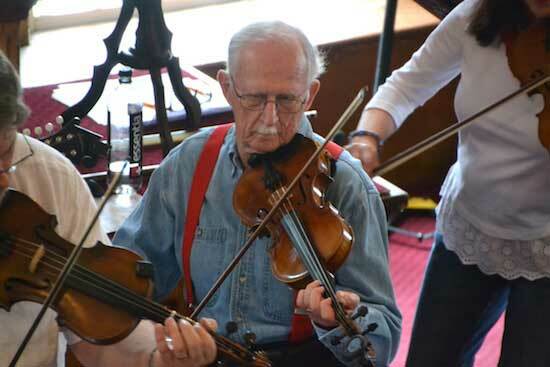 Fiddlers of the Genesee and Elderberry Jam really enjoy playing at senior centers, giving the residents a chance to relax and bring back memories, as many of them grew up with this music, Bailey said. 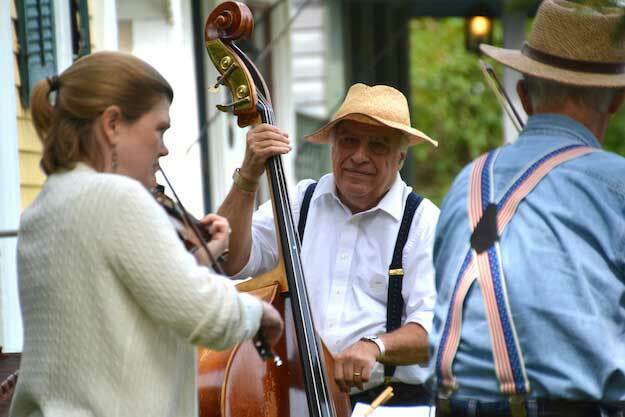 The music group is often seen playing at fairs and festivals through summer months and also serves as one of the sponsors of the Fiddlers Fair every August at Genesee Country Village Museum. A highlight of their annual events is when Fiddlers of the Genesee play at Bristol Valley Theater in October. “The Elderberrys are especially looking forward to playing for the Cobblestone Museum , as they have worked up very special arrangements of some of the members’ favorite tunes,” Bailey said. 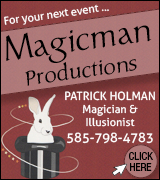 Admission to the concert is free, but a freewill offering will be taken to benefit the Cobblestone Museum. Farley suggests everyone come early to get a seat. The Cobblestone Church is located at 14389 Ridge Rd. at Childs, one mile north of Albion. GAINES – A firefighter gets ready to spray water on the back of a house that was on fire today. 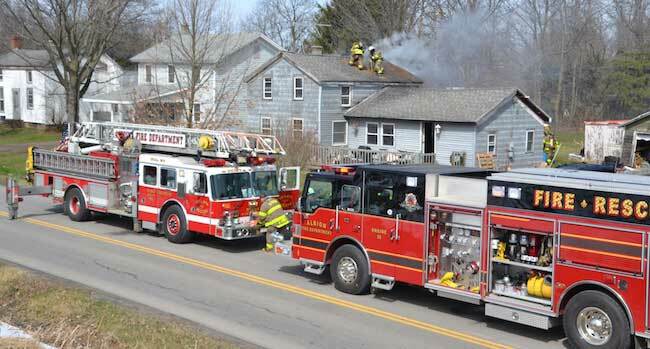 Firefighters were dispatched at about 11:30 a.m. to a structure fire on Eagle Harbor-Knowlesville Road in Gaines. No one was home when the fire broke out. Firefighters suspected the fire was caused by a wood stove, but the cause remains under investigation. 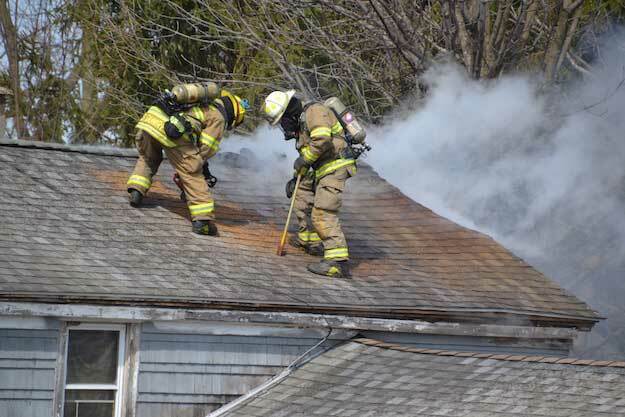 Carlton firefighters Seth Dumrese (lieutenant) and Chris Standish (assist chief) climbed to the roof of the house. They cut a hole in the roof to ventilate smoke at 13379 Eagle Harbor-Knowlesville Rd. 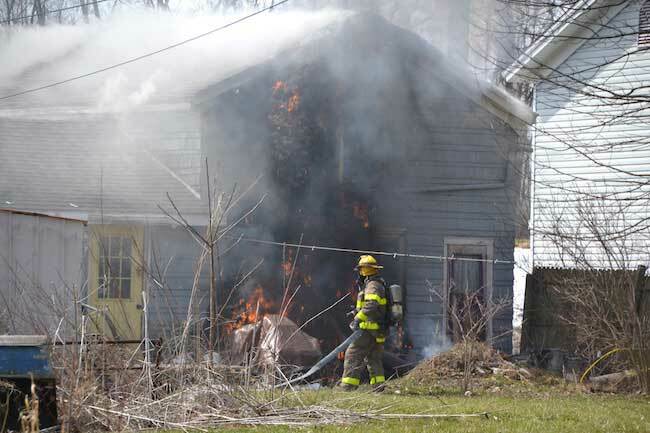 Albion, Medina and Carlton firefighters responded to the scene, as well as the Orleans County Emergency Management Office, and Albion police officers, the State Police, and the Orleans County Sheriff’s Office. 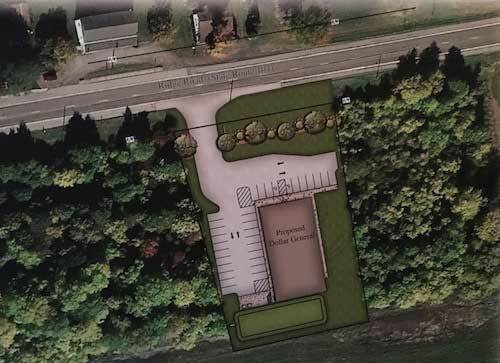 The Zaremba Group has proposed this design for a new Dollar General on Ridge Road, east of Route 98. GAINES – Town of Gaines officials say a developer is still working to build a Dollar General store on Ridge Road, but hasn’t been able to satisfy the State Historic Preservation Office, which has urged the developer to find an alternative location for the store. The Zaremba Group, the developer for the project, wants to put the new store across from the cobblestone schoolhouse, which was built in 1849. The schoolhouse is one of three cobblestone buildings that are a National Historic Landmark, the only historic site with that distinction in Orleans County. SHPO told the developer if it’s determined to build on that site, it needs to try to mitigate the impact, with trees as a buffer and moving most of the parking to the side of the building and not the front. SHPO also said Zaremba should offer money to help compensate for its impact on the Cobblestone Historic District. Photo by Tom Rivers: Gerard Morrisey, ZBA chairman, says an initial public notice about the project was vague and may have given the impression no one opposed the Dollar General. Zaremba offered $25,000 to the Cobblestone Museum, and that was rejected by the museum’s board of directors last week. Jon Hinman, an engineer and project manager with the MRB Group, shared that news with the Gaines ZBA during the board’s meeting on Monday. MRB is reviewing the engineering and site design for the project. The town hired MRB, and those fees are being covered by Zaremba. Hinman said he hasn’t seen any updated plans for the project in several months because Zaremba is trying to satisfy SHPO. If Zaremba can get the OK from the state agency, that could stop the project, Hinman said. 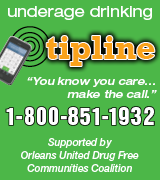 Zaremba could find another organization to give funding to, Hinman said, to meet that requirement from SHPO. Zaremba could reach out to the town, a local library or historical society to donate the money, Hinman said, or the developer could increase the amount and see if it is acceptable to the museum. Hinman also said Zaremba could look move the proposed store away from the cobblestone schoolhouse. About 1,200 people backed petitions from the Cobblestone Museum urging Dollar General find another location for the store, outside of the historic district. 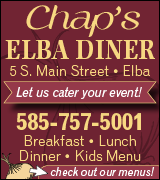 Morrisey said ZBA chairman shared other news during Monday’s meeting. The ZBA met with a Zaremba official about the project on Dec. 4, 2017. The minutes from that meeting have been sought by community members for much of last year, but the minutes only recently were made available. Morrisey said waiting more than a year for a record of that meeting is unacceptable. He also questioned the vagueness of a notice about a public hearing at that meeting. The notice listed the tax map of the parcel and Zaremba as applicant, but didn’t say which road the parcel was on, the address or owner of the property. That meeting is considered a milestone for the project because the ZBA gave the developer an indication a 9,100-square-foot store would be allowed in the historic district. The regulations for the historic district don’t allow new construction larger than 5,000 square feet. A general store also isn’t listed as a permitted use in the district, but a convenience store is allowed. Opponents to the project say the Dollar General should be considered a general store and not a convenience store. 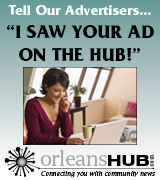 The proposed building or use is consistent with the architectural and historical significance of the area as a whole. 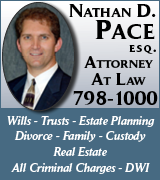 The proposed building or use does not encroach upon, diminish or otherwise adversely impact upon the other structures or uses within the district. The ZBA may have felt there wasn’t any opposition in the community for the project based on that hearing on Dec. 4, 2017. There weren’t any public comments about the project at the hearing. But Morrisey said the notice should have clearly stated what was being asked so the public could voice its opinion. ZBA board members Curt Strickland and David Thom said the ZBA was hindered for much of last year because it did not have a secretary. They said the Town Board should have found a secretary for the board. “It was up to the new Town Board to pick up the ball but they didn’t,” Thom said. The Dec. 4, 2017 meeting actually happened before the new Town Board took over on Jan. 1, 2018. The ZBA secretary ended her employment in November 2017, and a new secretary wasn’t in place for the December meeting. “For the minutes to just now appear is distressing,” said Morrisey, who was appointed the ZBA chairman this past January. Hinman, the engineer with the MRB Group, said his firm would be willing to help the town as it works to clarify the text for the historic district. The town has formed a committee to work on an update to the comprehensive plan for the community, as well as the historic district. 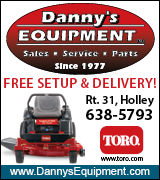 GAINES – The Town of Gaines Republican Committee is seeking candidates for town offices, including highway superintendent to succeed Ron Mannella, who is retiring and not seeking re-election. The Gaines GOP Committee welcomes Republican candidates interested in serving as highway superintendent, town supervisor and one of two other seats on the Town Board. 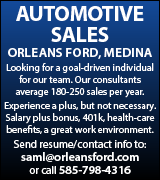 Interested candidates need to respond by Feb. 6 with an email to GainesGOP@gmail.com. Provided photos: Jim Bonafini (left), president of the Cobblestone Society and Museum, was honored on Saturday by the Orleans County Historical Association for making the wooden sign for Beardsley Creek on Route 104 in Gaines. Bonafini accepts the “Friend of Orleans County Historical Association” award from Al Capurso, president of OCHA which organized a ceremony on July 28 for the sign unveiling. 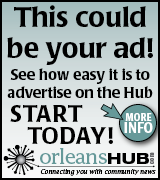 GAINES – The Orleans County Historical Association held its annual meeting on Saturday and celebrated a busy year. The group also picked a new president. 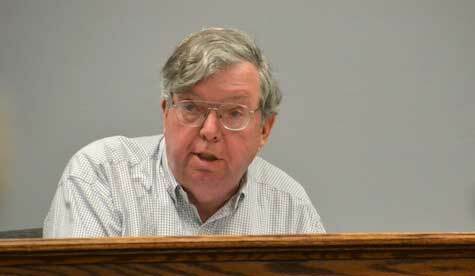 Matt Ballard, the Orleans County historian, will succeed Al Capurso. The outgoing president said it was an active year for the organization, especially with its efforts to preserve a former cobblestone schoolhouse on Gaines Basin Road. Capurso praised Bill Lattin, retired county historian, for his “countless hours” of work in restoration, planting trees and providing technical assistance to workers at the schoolhouse. John Flanagan also worked on the school for his Eagle Scout project, fixing the trim and painting at the site. Capurso also noted that Dan Flanagan gave a 1830’s-period door for the schoolhouse. Rick Ebbs and Lattin restored the schoolhouse’s swing set and set up the schoolhouse’s privy. Ebbs also has kept the property neatly mowed, Capurso said. 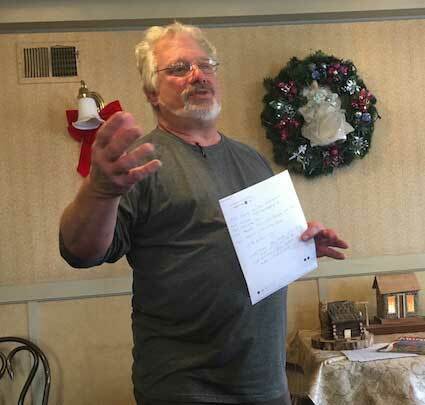 Larry Albanese, president of The Oak Orchard Lighthouse Museum, served as guest speaker on Saturday during the annual meeting for the Orleans County Historical Association. For the second year the schoolhouse was on the Cobblestone Society’s Tour Of Homes during the Orleans County Heritage Festival. About 30-40 people took a tour of the schoolhouse. 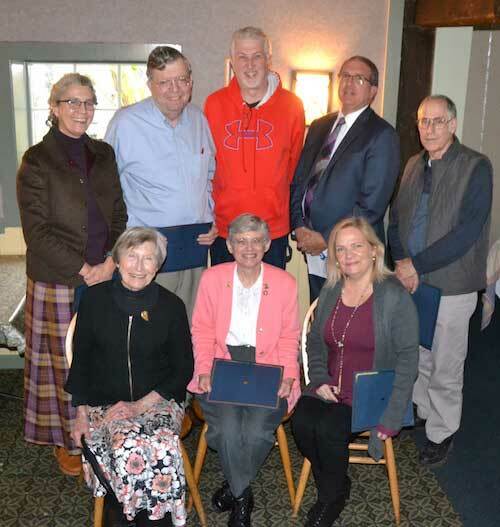 Along with the DAR, the Cobblestone Society and Hoag Library, OCHA co-sponsored a reception and recognition on April 26 for author Melissa Ostrom. Macmillan published her book, “The Beloved Wild.” That historical work depicts the courage of pioneers, who were typically only teen-agers when they settled in WNY. 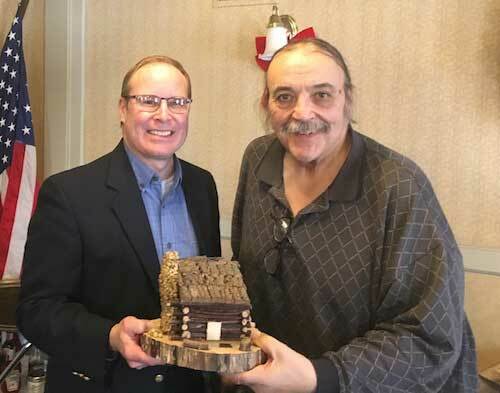 Ostrom was presented with a pioneer log cabin model with an engraved plaque on behalf of OCHA and the history-minded community. Capurso on Saturday also thanked the Cobblestone Society for allowing OCHA to meet in at the Cobblestone Society buildings, and to Director Doug Farley for loaning tables and chairs for events, and for updating the website. Helen Bilicki also was thanked for arranging some OCHA meetings at her residence. 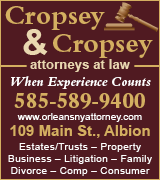 OCHA also was represented with a float in two parades – the Holley June Fest and the Albion Strawberry Festival. Leroy Neeper was commended for pulling the float with his truck and loaning his flatbed trailer. 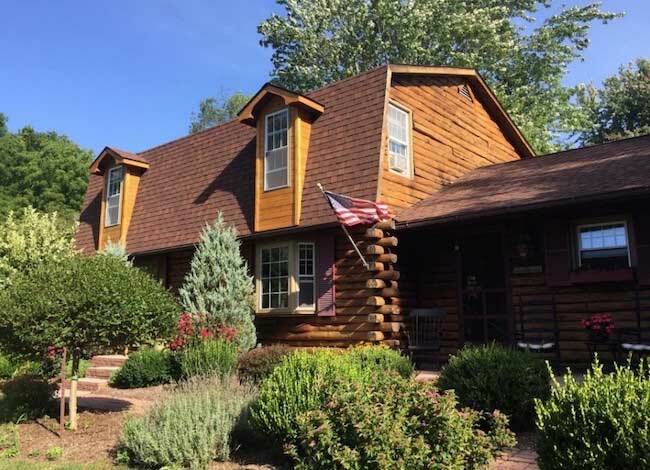 Provided photos: This log cabin home of Mark and Lois Chamberlain on Lime Kiln Road in Barre will be one of eight on Dec. 1 for the Christmas Tour of Homes. ALBION – When the Cobblestone Museum organized its first Christmas Tour of Homes last year, more than 200 people attended, making it one of the musuem’s most popular events of the year. On Dec. 1, the Cobblestone Museum will sponsor its second annual Christmas Tour of Homes, featuring eight distinctive properties in the Albion area, all decked out for the holiday season. Doug Farley, director of the Cobblestone Society Museum, said this is a perfect opportunity for people to enjoy the rich heritage of the region while touring 19th century homes in a variety of architectural styles. These include Victorian, Queen Anne, East Lake Victorian, cobblestone, Greek Revival and country farmhouse. Farley said the museum is excited about the diversity of homes on this year’s tour, including a Federal style home on farmland, a stone Italianate and a log home in Barre. Jan Mikael Erakare’s and Maarit Vaga’s home on East Avenue, Albion, will be decorated for the holidays during the Cobblestone Museum’s Christmas Tour of Homes on Dec. 1. 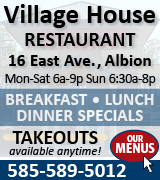 Featured sites are Fair Haven Treasures on Ridge Road, the Cobblestone Museum’s Ward House, Toni Plummer and Tom Stark’s home on Ridge Road, Mary Anne Braunbach’s home on Densmore Street, the Orleans Chapter DAR house in Albion, Joe and Debbie Martillotta’s home in Albion, Jan-Mikael Erakare and Maarit Vaga’s home in Albion, the Albion First Presbyterian Church, and the home of Mark and Lois Chamberlain in Barre. New this year will be a bus tour option, in addition to the self-driven tour. Visitors can leave their car at the Cobblestone Museum and ride in comfort on a motor coach, or choose to drive their own vehicle to each location. The tour runs from 2 to 7 p.m. For more information about ticket prices check www.cobblestonemuseum.org or call 589-9013. Also on Dec. 1 is the final day of the Holiday Shoppe at the Cobblestone Museum, with special prices on remaining books and Christmas decorations. In addition, local author Sharon Cassano-Lochman will be on hand from 1:30 to 3:30 p.m. to sign copies of several of her books. The Dec. 1 programs conclude a busy year for the museum, which had about 30 events in 2018. Photos by Tom Rivers: The following were recognized on Saturday with awards for their support of the Cobblestone Society and Museum. Front row, from left: Susan Hurd Machamer, Gail Johnson and Maarit Vaga. Back row: Amy Machamer, Gerard Morrissey, Marty Taber, David Mitchell and Greg Lawrence. Jennifer Leonard, CEO and president of the Rochester Area Community Foundation, also was recognized. GAINES – The Cobblestone Society and Museum held its annual meeting on Saturday and reported an increase in programming and revenue. The museum this year had 35 events, with more to come including a Christmas tour of homes on Dec. 1. 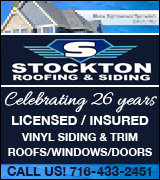 Jim Bonafini, the board president, reported that revenue has been on the rise, from $65,000 in 2016, $79,000 in 2017 to $103,000 so far this year. 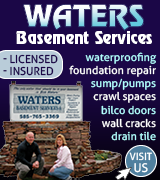 That includes funds from visitors, memberships, donations and grants. 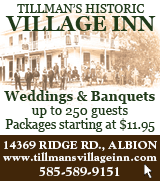 About 60 people attended the annual meeting for the society and museum on Saturday at Tillman’s Village Inn. The following were also elected as trustees: (3-year terms) – Joyce Riley, Marty Taber, Pat O’Brien and Maarit Vaga; (2-year term) – Maura Pierce; (1-year terms) – Mike Thaine and Kevin Hamilton. The society and museum also presented awards to several key supporters. David Mitchell in July donated a couch made by George Pullman in the 1850s to the Cobblestone Museum. 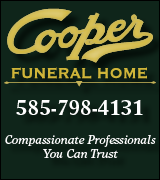 He acquired the couch when he purchased the Merrill-Grinnell Funeral Home in Albion. Mitchell wanted the couch to stay in the community and be displayed for the public to enjoy. He was recognized with a Pullman Award on Saturday for the donation. • Pullman Award – This is a new award given to recognize a generous donation that enhances the collection at the Cobblestone Museum. In July, David Mitchell donated a couch made by George Pullman, when he was a furniture manufacturer in Albion, before he moved to Chicago and developed the Pullman’s Palace Cars for the railroad industry. Mitchell acquired the Merrill-Grinnell Funeral Homes in Albion and Holley. The Albion funeral home had a Pullman couch. Mitchell made that couch a stipulation of the sale of the funeral home. He then donated it to the museum. 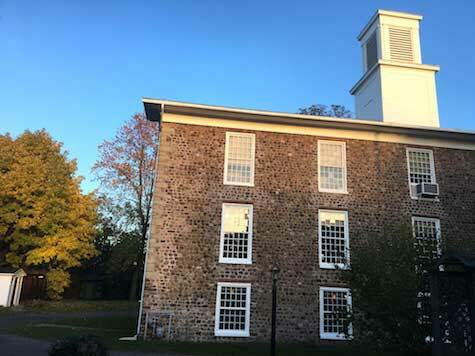 • Community Partner of the Year – The Rochester Area Community Foundation which has provided $44,000 in grants the past two years for a series of building improvements on the three cobblestone buildings that are pre-1850. 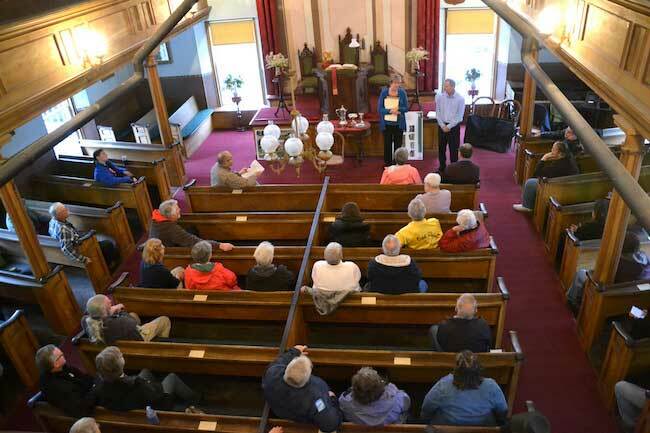 A grant for $23,000 went towards restoring windows and some repointing on the Cobblestone Church, as well as work on the next-door Ward House, which was built around 1840. The stairs on the house have been crumbling and were fixed with the grant funds. A grant for $21,000 this year is focused on the schoolhouse from 1849. 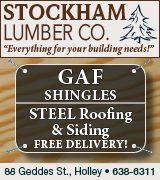 The schoolhouse will soon get a new roof, repaired masonry and fresh paint on the window trim and soffits near the roof. 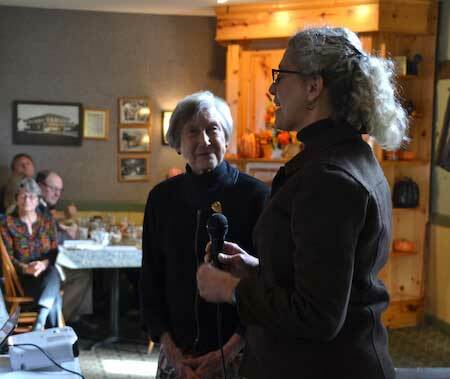 Jennifer Leonard, president and CEO of the Foundation, thanked the museum for its work to preserve the three cobblestone buildings on Route 104, which were built before 1850. Those three buildings were named a National Historic Landmark in 1993. Amy Machamer and Susan Hurd Machamer, owners of Hurd Orchards in Murray, have referred many customers to the Cobblestone Museum. 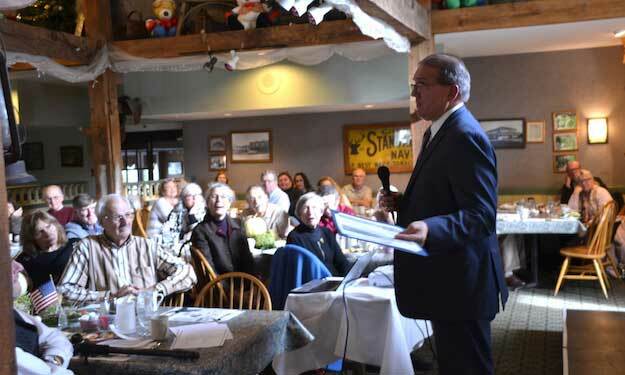 Hurd Orchards also does an annual cobblestone luncheon with a speaker from the museum. A collection taken at the luncheon has been growing in recent years to help support the museum. • Business Partner of the Year – Hurd Orchards for many years has promoted group tours for the museum. Hurd Orchards touts the museum in the community and with the farm’s customers. Hurd also has collected funds for the museum, a total that has been on the rise. The late Betty Hurd was an early supporter of the museum and the Cobblestone Society more than a half century ago. She has instilled a love of history and the cobblestone buildings in her daughter Susan Hurd Machamer and granddaughter Amy Machamer. • The Proctor Award is named for the founder of Childs who helped establish the Cobblestone Church. The award is given to someone who goes above and beyond to assist the museum in an extraordinary manner. The museum presented three Proctor Awards to recognize people for their efforts in 2018. • Gail Johnson developed and coordinated a Membership Dinner and the Underwriting component, plus new initiatives for Development and Membership. That work resulted in about $40,000 for the museum. 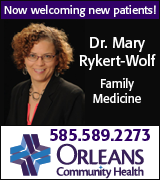 She has welcomed new donors to the museum. She also is a significant donor herself, offering the museum land, barns and monetary gifts. She also volunteered in many roles this past season. 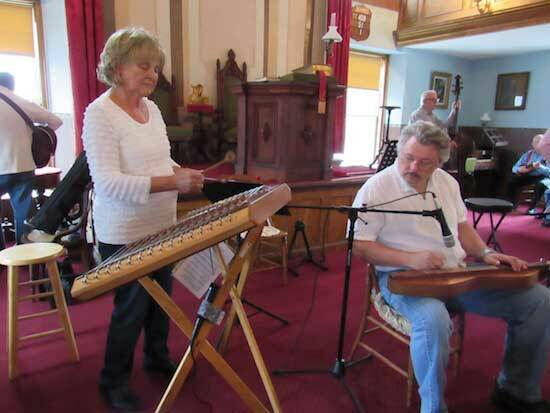 • Maarit Vaga organized a Progressive Organ Concert on May 12 and also prepared the main dinner of French beef stew for 120 people which was served at Christ Episcopal Church. The concert and meal included three stops. The event was very popular with the participants. Vaga also wore the Cobble the Mouse costume in local parades to promote the museum. • Gregory Lawrence of Clarendon has been working to digitize a collection of about 3,500 photographs of 700 cobblestone structures in New York State, images from Robert L. Roudabush between 1976 and 1980. 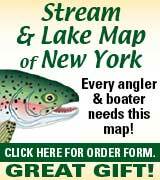 The images and scans of maps from 21 counties will be available online through the Cobblestone Museum and the Landmark Society of Western New York. 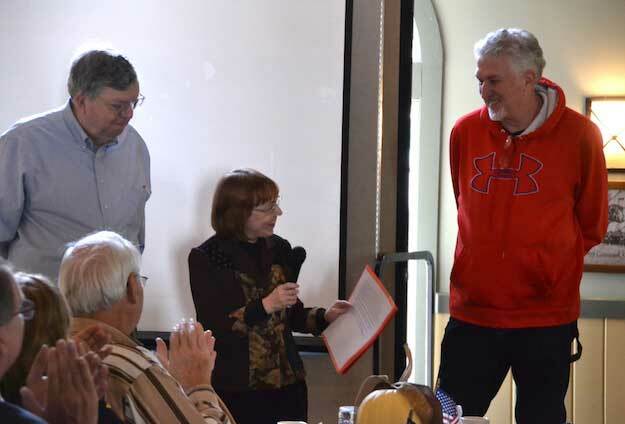 Sue Bonafini, the museum’s assistant director, presents the volunteer of the year awards to Gerard Morrisey, left, and Marty Taber. She wrote a poem about how the two so frequently help with museum events. • Gerard Morrisey has been a dedicated volunteer as a docent, stepping in whenever he is needed, including the Ghost Walk on Oct. 6 when he portrayed Rufus Brown Bullock, the former Georgia governor who grew up in Albion and moved back to his hometown after his career. • Marty Taber was one of the coordinators of the Ghost Walk, and wrote the script for the different characters highlighted on the tour. 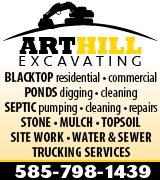 He also helps the museum by giving tours, working on landscaping, and with buildings and grounds projects. 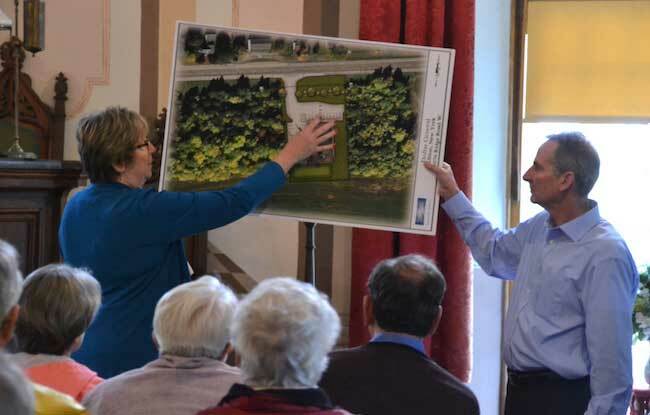 Photos by Tom Rivers: Officials from the Zaremba Group, which is working to build a new Dollar General in Gaines, met with about 50 people on Thursday at the Cobblestone Universalist Church, which is part of the Cobblestone Museum. Mary Ann Wervey is vice president of Retail Development for the Zaremba Group and Gary Hough is senior director of development. 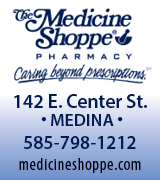 This is a rendering of the design for the new store proposed on Route 104. GAINES – The developers working on a controversial new Dollar General store that would in a historic commercial district say Dollar General wants to stay at a site that would be across from a cobblestone schoolhouse built in 1849. Two officials from the Zaremba Group traveled from Cleveland to meet with Cobblestone Museum leaders and supporters on Thursday to go over the plan for the new 9,100-square-foot store. 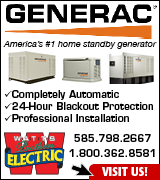 Zaremba builds about 40 Dollar General stores a year. Zaremba buys the land, builds the store and leases the site to Dollar General. The proposed site for the Gaines store is in a wooded area, just east of the routes 98 and 104 intersection. It is a high traffic area, and is the preferred location for Dollar General, which does the market analysis for its stores, said Gary Hough, senior director of development for Zaremba. Doug Farley, the museum director, presented 1,186 petitions against the Dollar General’s proposed site in the historic district. Farley handed the petitions to Hough and Mary Ann Wervey, vice president of Retail Development for the Zaremba Group. Farley said the project should have never been considered by the Gaines Zoning Board of Appeals. 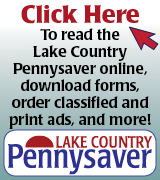 A zoning misinterpretation has, unfortunately, allowed Zaremba to spend money on a site that shouldn’t be developed for a commercial chain store, Farley said. About 50 people attended the 4 p.m. meeting to hear about the proposed Dollar General. The historic commercial district allows convenience stores, such as Crosby’s. However, the district doesn’t allow a general store. The Dollar General was deemed suitable in the zoning by Gaines ZBA officials, who said it is a convenience store. However, the Cobblestone Museum said the Dollar General, at a proposed 9,100 square feet, should be considered a general store, and thus not allowed in the historic district. Farley said the presence of the Dollar General would have a damaging effect on the Cobblestone Museum and the historic district, an impact that couldn’t be reversed once the store was built. Museum supporters worry that the Dollar General would also bring more chain stores to the district. Zaremba is developing about 1 acre for the store, but 4 other undeveloped acres are next to the site. The developer says the store would be shielded with vegetation. 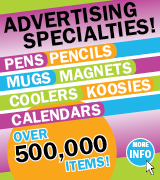 There are already five Dollar General stores in Orleans County – Albion, Holley, Kendall, Medina and Ridgeway. 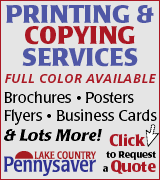 That seems to be more than enough, the Zaremba officials were told. However, Hough said Dollar General sees more opportunity in the county with the store in Gaines. 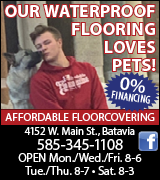 Farley asked Zaremba to hold off on pushing for the store for at least six months because Gaines is looking to update its comprehensive plan and possibly expand the commercial district on Route 104. Hough said the developer is limited right now where a commercial building can go in Gaines on Route 104. The commercial district is limited to historic area of Gaines. Farley also asked the company to look at undeveloped land across from the Gaines Town Hall. That would be a prime spot for the Dollar General, he said. Hough and Wervey said they would share the concerns from the museum with Dollar General. Hough also said the company has some screening in the plan for the building, should it go across the street from the historic schoolhouse. The store also will have an upgraded look from many of the stores, he said. GAINES – The Cobblestone Museum will recognize several key supporters during an annual meeting at noon on Nov. 10 at Tillman’s Village Inn. The public is welcome to attend to annual meeting to hear about the past year at the historic site. Officers and trustees will also be elected for the museum, a National Historic Landmark with buildings on Route 104 and Route 98 in the hamlet of Childs. In 2016, the museum started presenting awards to supporters and volunteers. The late Betty Hurd was an early supporter of the museum and the Cobblestone Society more than a half century ago. She has instilled a love of history and the cobblestone buildings in her daughter Susan Hurd and granddaughter Amy Machamer. 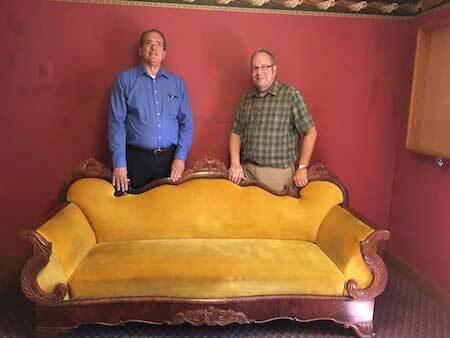 David Mitchell, left, donated this couch made by George Pullman in the 1850s to the Cobblestone Museum. Mitchell is pictured with Doug Farley, the museum’s director, in the Danolds Room on the first floor of the Cobblestone Church. • Proctor Award is named for the founder of Childs who helped establish the Cobblestone Church. The award is given to someone who goes above and beyond to assist the museum in an extraordinary manner. The museum is presenting three Proctor Awards to recognize people for their efforts in 2018. 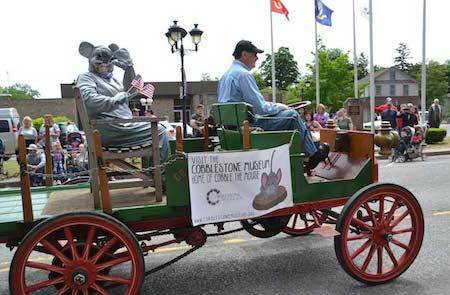 Maarit Vaga dressed as Cobble the Museum Mouse for the Cobblestone Museum at the Holley June Fest parade. She rode in a 1911 Reo truck owned by Russ Bosch of Clarendon. • Maarit Vaga organized a Progressive Organ Concert on May 12 and also prepared the main dinner which was served at Christ Episcopal Church. The concert and meal were very popular with the participants. Vaga also wore the Cobble the Mouse costume in local parades to promote the museum. • Gregory Lawrence of Holley has been working to digitize a collection of about 3,500 photographs of 700 cobblestone structures in New York State, images from Robert L. Roudabush between 1976 and 1980. The images and scans of maps from 21 counties will be available online through the Cobblestone Museum and the Landmark Society of Western New York. 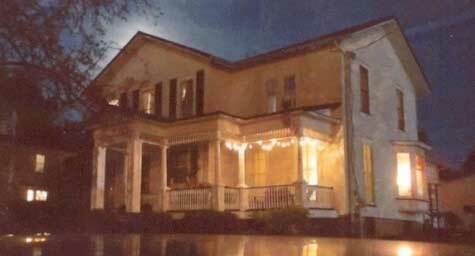 • Gerard Morrissey has been a dedicated volunteer as a docent, stepping in whenever he is needed, including the Ghost Walk on Oct. 6 when he portrayed Rufus Brown Bullock, the former Georgia governor who grew up in Albion and moved back to his hometown after his career. The annual meeting is open to the public. 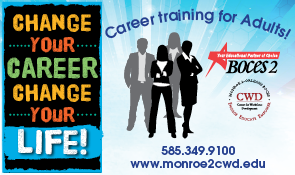 The deadline to RSVP is Nov. 5. 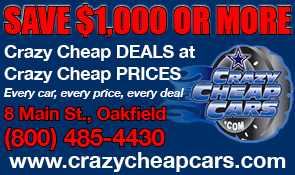 For more information, call the museum at 589-9013 or click here.